He’s mighty, ferocious and loves a good bagel. He’s green, with tiny arms that can barely fit around a peanut. He is our mascot, Bagelsaurus Rex and he is excited to meet each and every one of our Bagel Bakery friends. Bagelsaurus Rex wandered into the Bagel Bakery a few weeks ago in search of the best bagel in town and since he found us, he has not wanted to leave! He is a great help with sales and business. He has the grand task of holding up our special of the day. He asked us if he could one day be promoted to cashier, and since we believe that everyone deserves at least one chance, we will begin training him for the job soon. Although this new bond between Bagelsaurus Rex and the Bagel Bakery transpired only a few weeks ago, we firmly believe that this has the potential to be a life-long bond. 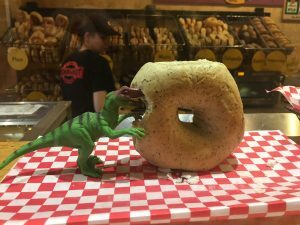 Stop by the Bagel Bakery today to say hi to Bagelsaurus Rex, and to try the special of the day as per his recommendation.